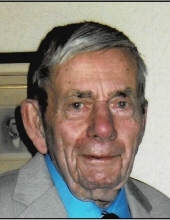 Donald J. DeLater, age 85 a lifelong Rochester resident passed away at his home on Friday, April 12, 2019. Donald was born on May 10, 1933 the son of Howard and Marie (Glaska) DeLater. Donald went through the Rochester school system and graduated from Rochester High School. Donald worked for his father and alongside his brother at “DeLater and Sons” a John Deere Tractor & Implement dealership in Utica where he worked as a mechanic. After his retirement he enjoyed going to see his daughter Dana in Arizona. All his life he enjoyed fishing, hunting, farming, and working on his antique John Deere tractors. Donald had a true passion for his cats, loved taking care of them, and even rescuing them. Donald is survived by his two children Ted (Susan) DeLater of Rochester Hills & Dana (John) Florence of Arizona along with 9 grandchildren. Also survived by his brother Clarence (Carol) DeLater. Donald was predeceased by his brothers Larry and Ben. Funeral services will take place on Tuesday, April 16, 2019 at 7 PM at the Henry M. Malburg Funeral Home of Romeo with Father Jerry Kessel. Visitation will be on Tuesday, April 16, 2019 from 2 to 8 PM. Burial will be private and will take place at St. Peters Cemetery in Mt. Clemens, Michigan. To send flowers or a remembrance gift to the family of Donald J. DeLater, please visit our Tribute Store. "Email Address" would like to share the life celebration of Donald J. DeLater. Click on the "link" to go to share a favorite memory or leave a condolence message for the family.